Microsoft is celebrating leap day with a desperate price cut on Windows Vista in an all out effort to temp those that know better than to adopt their software version of Chucky. The fully-featured version of Vista Ultimate, will be $319 instead of $399. 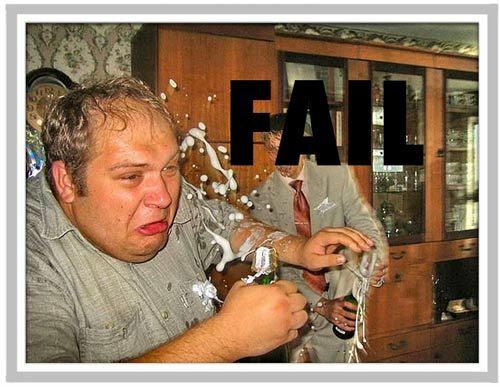 One more move that's a toast to Vista's epic fail! Microsofties know too well that as soon as they drift off to sleep Chucky will slash up everything inside, starting with their hard drive. Click here if you care to read the entire price slashing horror story. 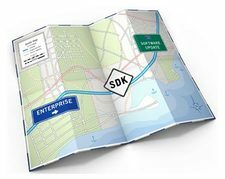 SAN JOSE, CA - Conflicting reports are trickling in about a gang of unsavory hucksters selling what appear to be unauthorized iPhone SDK Roadmap tee shirts (see mock-up). The shirts are supposedly imprinted with the highly publicized roadmap invite issued by Apple, Inc. this week for their March 6th iPhone SDK media event. Reports tell of several dozen shirts selling out quickly from various street corner hawkers to unsuspecting morons in and around downtown San Jose starting shortly after 4:00 PM. 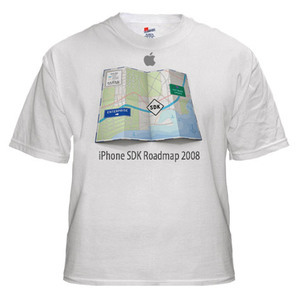 According to email messages, the wildly popular "iPhone SDK Roadmap 2008" tee shirts are being sold for $20 each with vendors promising unwitting buyers that the shirts are required to gain access to the special Apple event next week. The shirts ought to have "You got pwned!" printed across the back for those winners of the coveted Bay Area "Ima Nidiot Award". Others are reporting that poorly knocked-off versions of printed roadmap invites are also being offered with the same promise of exclusive event access. It's unfortunate that these bogus tee shirts will only serve to undermine the value of the authentic limited edition iPhone SDK roadmap shirts Apple intends to hand out at the close of next weeks gathering. See! This is why we can't have nice things! More on this story to follow. It's 10:00 AM on a school day, do you know what your kid is doing? This highly educational video entitled "Got Bored At School?" offers parents an enlightening look at connected learning in the modern classroom. It can be very difficult to detect an iPod Touch slipped into the front of a typical book bag as demonstrated in this clip. Our young rogue director appears to be in a Junior High or High School class, making this lesson a lot harder to digest. Some Apple innovations may be long discontinued but they are never truly forgotten. 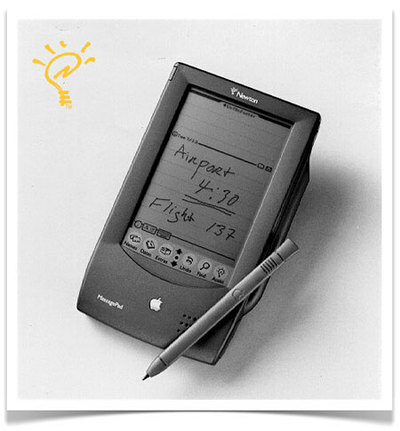 It was February 27, 1998 when Apple announced the death of their Newton MessagePad series. On this tenth anniversary of Newton's untimely demise, the iPhone Savior has lovingly commissioned a special commemorative cake to honor a small group of loyal Newtonists who continue to carry the glorious Newton flag waving high above their fossil like craniums. Unfortunately they won't get to enjoy any of the cake that was actually supposed to read "Happy Deadday" but that never happened. We also invited music fossil Randy Newman to pen a tired Newton song for our special memorial, but he declined. The event is scheduled to take place at Apple's Town Hall on the Cupertino Campus, March 6th. It turns out that the SDK delay rumors were accurate. No one is certain if Apple plans to actually launch the SDK on March 6th or if they intend to only reveal the iPhone software roadmap and offer the media a chance to learn more about the highly anticipated iPhone SDK? That answer will have to wait. It appears that the stink from a deftly polished turd, code name Windows Vista, is about to get a whole lot stinkier before the entire shiteree comes to a head. A federal judge has granted class-action status to a lawsuit against Microsoft for misleading marketing that featured stickers on PC boxes reading "Windows Vista Capable" PC even though the PCs couldn't run the most important features of Vista, according to Computerworld. Microsoft's sticker message is best defined as spin more than authentic marketing. 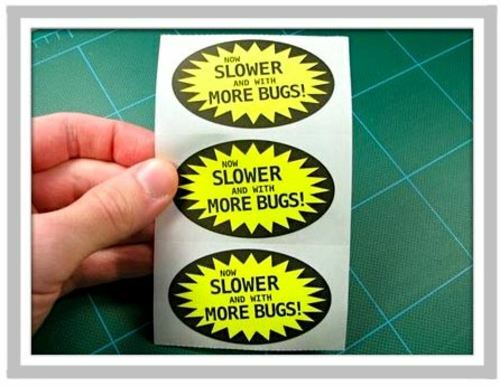 The geniuses over at "Evil Mad Science" created a new sticker that may better reflect the real experience awaiting consumers who purchase a PC loaded with Windows Vista. "There's no rocket science here," said Dave Block, a senior product manager for Vista in a CNET post back on March of 2006. Apparently Dave must have been talking about their stickers since the Visa launch has amounted to an epic failure proving to be far more difficult than rocket science. A turd by any other name would still stink as much. According to a report posted on iPhone Atlas, iPhone 1.1.4 update fixes some nasty little bugs introduced with update 1.1.3, starting with the SMS message ordering problem which has vexed many users. Apple has acknowledged this issue in a Knowledge Base article. The problem appears to be resolved under iPhone software/firmware 1.1.4 as stated by iPhone Atlas. Other fixes point to bluetooth, sending mail, dropped calls and weak signals as more iPhone user info continues to slowly filter in. Some users are confirming a surprise boost in signal strength after the 1.1.4 update [link]. Read the entire post at iPhone Atlas, a group that continues to do a great job dissecting the iPhone. We have received multiple emails from readers that were holding out for the ever elusive iPhone SDK release rumored to materialize today. 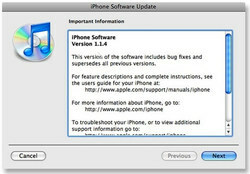 While we do know that an iPhone SDK release is imminent, the iPhone 1.1.4 update is now available for download. The 1.1.4 update for iPhone and iPod touch is a solid a clue that an SDK is following close behind. More to follow on what the iPhone update includes beyond what Apple has listed "fixes bugs and supersedes all previous versions". The new firmware update is roughly 162.1MB in size. Jailbroken or unlocked iPhone users need not apply, yet. There is nothing worse than being an illiterate Facebook user, a common social defect that keeps thousands of young people form achieving their full Facebook potential. Don't let Facebook be one more reminder that you're socially inadequate, technology challenged and unable to attract virtual friends, when real help is within reach for only $14.99 (£5.99). I gots me help. Now it's your turn! 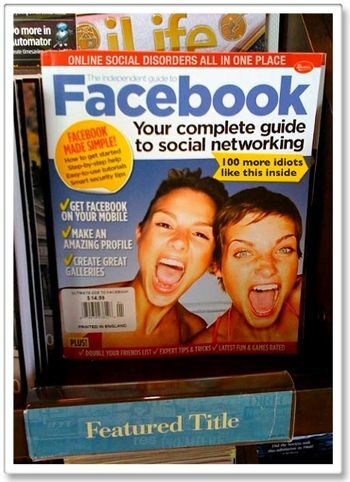 The wildly popular independent guide to Facebook is the single answer to all your social networking ills. Learn to make an epic profile and create great galleries that are sure to double your friends list in a matter of days. Perfect the art of taking photos with your mouth wide open, giving the appearance that your life is a full-time raging party. Gain helpful tips on how to attract the kind of online friends you would never be caught dead with in real-life. Finally, there's an authentic tool on Facebook just like you. Order your guide today [link], become an online legend tomorrow. Read Steve Jobs "The Problem With Facebook"
I mentioned in an earlier post [link] that the idea of a disposable iPod is much closer than anyone can imagine. Amazon offering a free 1GB iPod Shuffle with the purchase of a 32 GB iPod touch by all means pushes my prediction in the right direction, though it's a bit redundant. 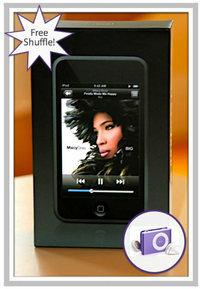 Amazon's is hawking their bundled iPod deal for $494 which includes free standard shipping. Apple's glorious Touch features the new Mail, Maps, Stocks, along with Wi-Fi and other applications that make it a brilliant piece of technology even without the bundled Shuffle. Eligible 1GB Shuffles include the blue, green, silver, and purple models. Maybe you can get your girlfriend to stop binging and purging long enough to pick out her favorite color. Good luck with that.